Yeah! Burger have taken over the food duties at The Star By Hackney Downs, the pub on Queenstown Road, E5, on Monday to Saturday. They will be serving a Christmas menu - see above - from now until 20th December 2014, when the residency will end. 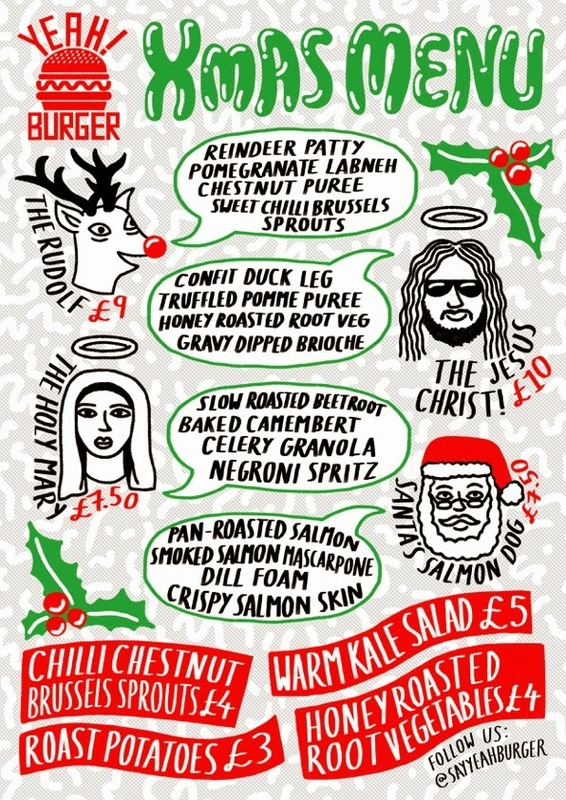 Oh - and there's a party on Thurs 18th December with some free sliders! "From Thursday 4th September until Christmas, Yeah! Burger – who count Danny Boyle as a fan – will serve up their spin on the burger, with a focus on uncomplicated flavours and super-fresh roduce. Enjoy west-coast style burgers, alongside Californian and Mexican-inspired fries and sides, plus a new wider menu featuring hot dogs and ice-cream desserts. Yeah! Burger is a collaborative project between Hackney chefs Adam Newman and Scott Hopkins, who met while working at Broadway Market’s much-loved fishmonger Fin & Flounder. Honing their skills at Lucky Chip and Death by Burrito over the past three years, they begin this residency after successful summer stretches at Cargo, Glastonbury and Shuffle Film Festival."